Privacy is assured at this secluded rental. Off the main road and surrounded by trees, it’s a great place to relax. This newly renovated home is bright and sunny with extensive windows for plenty of natural light. The open concept floor plan is efficient and low maintenance, with wood floors, vaulted ceilings and new furnishings. The sunroom faces the large backyard giving a great spot to enjoy the outdoors without having to worry about bugs or bad weather. The loft is always a popular spot for grandkids with 2 sleeping bags provided. 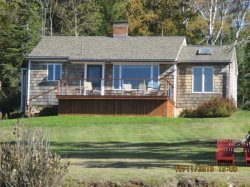 Just a short distance from South Bristol village and convenient for exploring midCoast Maine. Enjoy scenic walks around Rutherford Island. Rental comes with dock space at Bittersweet Boat Landing just two blocks away. If this property has one of the following amenities you will see a ü beside it.